Jay and Silent Bob Strike Back! Perhaps Kevin Smith set out to make a bad movie, then accidentally created a pretty good one. Jay and Silent Bob are two foul-mouthed, yet lovable dolts that have appeared in many, if not all (I haven't seen them all) Kevin Smith films. Finally, after paying they're dues as mere side characters ... they are the stars of their very own film. We all knew somebody like Jay (Jason Mewes), back in high school. Long-haired, weed smoking/selling, uses the words "F*ck" and "Sh*t" as often as the common articles "the" and "a." Nor does he restrain himself from blurting out references to male or female genitalia in mixed company. This complete lack of a social verbal filter makes him oddly endearingly sincere. Silent Bob (Kevin Smith) is Jay's polar opposite sidekick. Silently agreeing or disagreeing with the plethora of opinion and distaste clamoring out of Jay's jaws. This coupling drives the film. Ironically, every word out of Jay's mouth is written by Kevin Smith (Silent Bob). Off screen, Smith (brain sharply engaged) has even more to say (see interviews) than Jay (brainless) on screen. Jay and Silent Bob learn that a movie is being made in Hollywood about two comicbook characters (Bluntman and Chronic) which were based on them. Once acclimated to the Internet, Jay and Bob read vile emails dissing their characters. Rather than sue the film for unauthorized likeness usage, they propose a plan to drive to Hollywood and stop the film from being made so that they won't be dissed anymore on the net. Then, if time permits, beat up all those responsible for the flaming emails. Odd, quirky, sometimes silly, detours comprise two-thirds of the film. Often, this can make the audience antsy "Get to Hollywood already!" But, Bob and Jay never cease to amuse. Even their Hollywood-based scenes continue to keep the ball rolling. Rough in the start off, as the film itself says, "A poor Cheech and Chong rip off", the film eventually escalates to a full-fledged good movie complete with action, romance, drama, and all the cuss words you can stand. Despite, the occasional fourth wall break, where Jay and Bob stare right into the audience, "What kind of buttheads would pay money to see a movie about us?" the film is quite respectable in a disrespectable "South Park" kind of way. Complete with a galaxy of star cameos, from Affleck to Mark Hamill (Luke Skywalker), Smith-lovers will appreciate the return of many other Smith-film characters. But, even if you've never seen "Clerks," "Chasing Amy," "Mallrats," or "Dogma" I think you're in for a good time. Leave your thinking caps at home and just enjoy. The performances vary from strong to silly, Will Ferrell absolutely rocks as the Barney Fife-like Wildlife Marshall, "Who let the cats out?" Btw, Kevin tells us that Alanis will give the film a bit of a PS if you can hang through the ending credits. 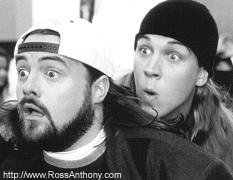 Jay and Silent Bob Strike Back!. Copyright © 2001. Rated R.
Starring Jason Mewes, Kevin Smith, Shannon Elizabeth, Ben Affleck, Matt Damon, Jeff Anderson, Diedrich Bader, Eliza Dushku, Will Ferrell, Mark Hamill, Ali Larter, Jason Lee, Brian Christopher O'Halloran, Chris Rock, Sean William Scott, Jules Asner, Marc Blucas, George Carlin, Shannen Doherty, Carrie Fisher, Jamie Kennedy, Steve Kmetko, Tracy Morgan, Judd Nelson, Jennifer Schwalbach, Jon Stewart. Written by and directed by Kevin Smith. Produced by Scott Mosier at View Askew/Dimension/Miramax.